Shopping2Scale: Dessert Giveaway For the Holidays, Interested? Dessert Giveaway For the Holidays, Interested? 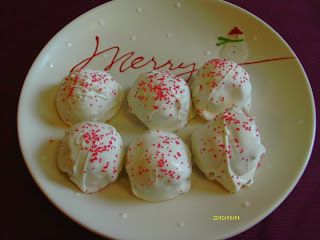 I am teaming up and picking up a couple of gift certificates to my friend Micheles' website http://inspiredbyhimcakes.blogspot.com/2010/11/carrot-cake-truffles.html to give away some cake truffles, I'm sure you will love these. Please hop on over to her website and see if you would be interested. I'll be giving away (2) gift certificates $10.00 each. You can order her truffles 1/2 dozen, or dozen. She has several flavors to choose from. Hope you enjoy. I will end this give away Sunday evening November 21, 2010. I know its short notice but thought you might be able to enjoy them around the holidays. This is my first giveaway, so please leave me a comment below and I will draw the lucky winner on sunday evening.